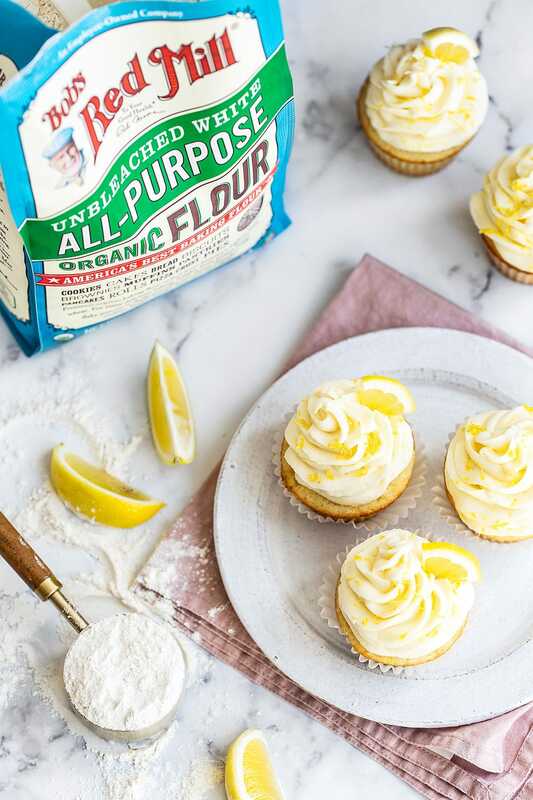 Easy homemade Lemon Cupcakes with lemon cream cheese frosting have the perfect balance of sweet and tanginess and are perfect for spring, Easter, or Mother's Day! This recipe is sponsored by Bob’s Red Mill. Thank you for supporting me in working with brands I love to bring you new recipes! Taste: The perfect balance of sweet, tart, and fresh. Texture: The cupcakes are tender, light, and fluffy while the frosting is ultra rich, smooth, and creamy. Ease: Very simple and easy. No need to purchase bland grocery store cupcakes!! Pros: Fresh and flavorful. Such a crowdpleaser. These will VANISH. I have to say that right behind chocolate, my favorite dessert flavor is probably lemon. 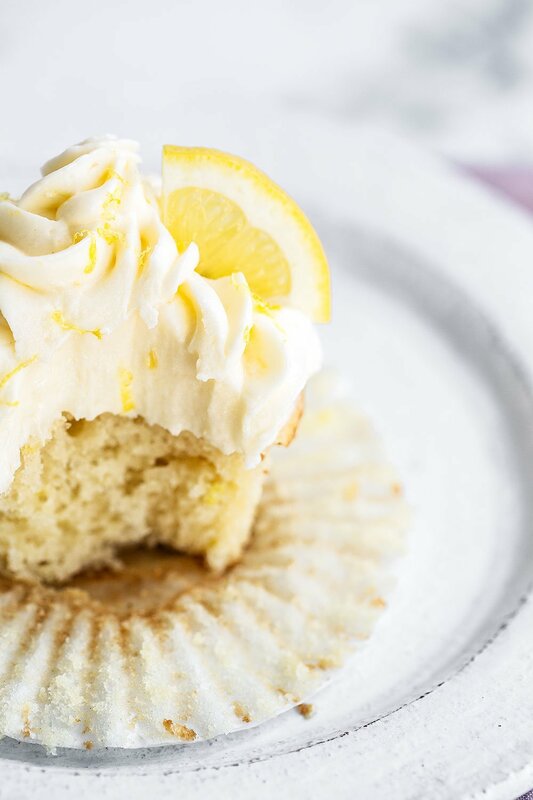 Lemon goes good on SO many savory foods, but when coupled with sugar it’s the perfect marriage. Fresh, tangy, and sweet blend together so nicely. 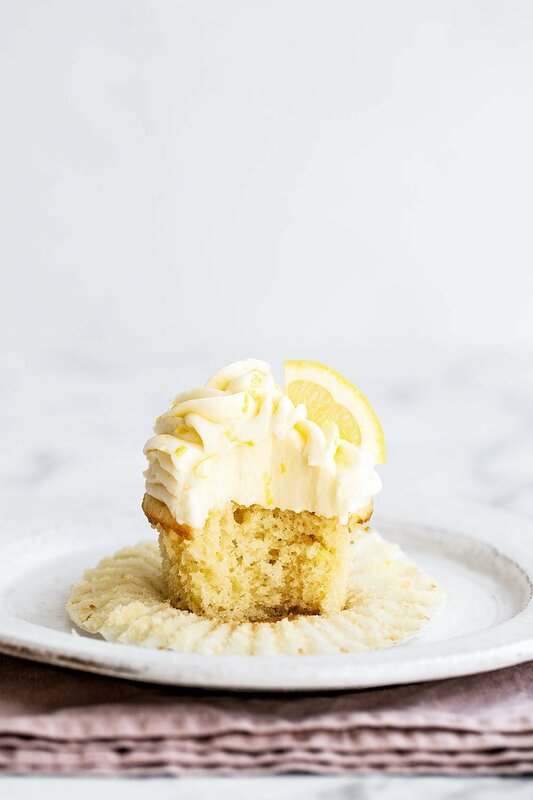 These Lemon Cupcakes would be perfect for ANY spring or summer festivity. Easter or Mother’s Day would be particularly perfect, even a baby shower or bridal shower for something fresh and easy! Anytime I’ve brought these cupcakes to a picnic or potluck they’ve vanished within minutes so you may want to bake a double batch. Once again I’m partnering with one of my favorite baking ingredient brands, Bob’s Red Mill, to bring you this spring cupcake recipe. Bob’s Red Mill doesn’t just produce high quality flours, grains, and tons of other go-to ingredients, but they’re also employee-owned. I find that pretty amazing in this day and age! I thoroughly enjoy working with brand partners that have a strong company culture of family and community. Their Organic All Purpose Flour is perfect in this recipe. Learn more about Bob’s Red Mill and stock up on baking ingredients here. How Do I make moist & tender cupcakes? Firstly, it’s key that you measure your ingredients properly. Especially your flour. It’s ridiculously easy to accidentally add too much flour when using measuring cups. I like to use the spoon and level method or better yet, a digital kitchen scale. Learn more about the importance of measuring flour correctly here. 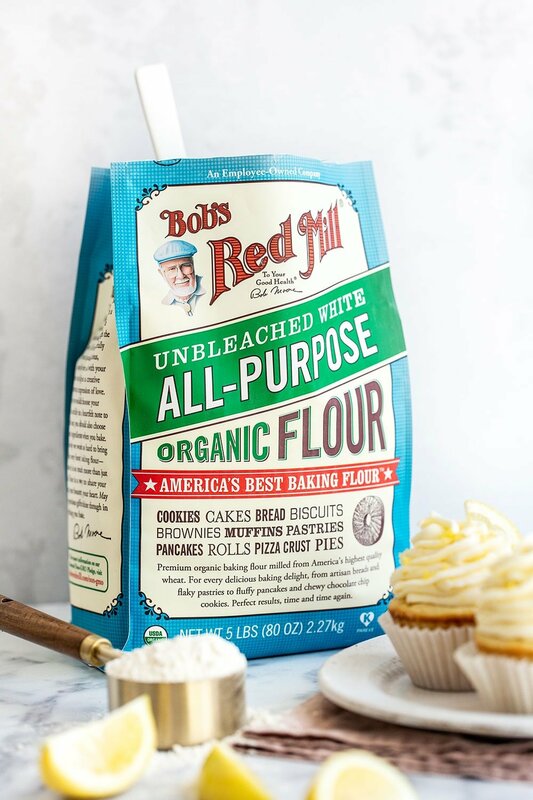 Bob’s Red Mill Organic All Purpose Flour has a protein content of 10-12% so it’s enough to create cupcakes that maintain their shape and hold up to a generous amount of frosting, but soft enough to yield a tender texture. With this recipe you really want to make sure not to overmix the batter which can create dense and gluey cupcakes. Use a gentle hand and stir until JUST combined. Fat not only provides richness, it also enhances flavor. It helps tenderize the cupcakes. For those reasons I highly recommend using whole milk, but if you only have 2% that will work in a pinch. I wouldn’t recommend skim milk. Oftentimes this is due to the brand of liners. This is my favorite brand that I order in bulk from Amazon. I’ve written an entire post on how to prevent cupcake liners from sticking here in case this is a common problem for you. This recipe includes an amazing fresh lemon cream cheese frosting. Its tangy freshness balances the sweetness so perfectly. Be sure your cream cheese and butter are COMPLETELY at room temperature before beating for a smooth lump-free frosting. Scrape down the sides of your mixing bowl as you beat the butter and cream cheese. Even if you have a paddle attachment that scrapes the sides as it goes, those usually don’t get the very bottom of the bowl. Also don’t skip on sifting the powdered sugar if you want smooth and picture perfect icing. If you need a stiffer consistency for piping with a decorative piping tip, feel free to add more powdered sugar. If you don’t like cream cheese frosting (gasp!) you can always add the lemon zest + juice in this frosting recipe to my Best Buttercream recipe. The cupcakes can be baked and stored in an airtight container a day ahead of frosting. The frosting itself can be made ahead of time and stored in an airtight container in the fridge for up to a week. Just bring to room temperature and beat until light and fluffy again. The frosted cupcakes can be left at room temperature for up to 8 hours, since the sugar in the cream cheese frosting acts as a preservative. After that, you’re best off refrigerating the cupcakes in an airtight container for up to 2 days. Let come to room temperature before serving. If you’re serving these outside on a warm day, just keep them in the fridge until you set up for your party, picnic, potluck, or whatever. They’ll lose their chill just in time to be eaten. This will prevent melting. 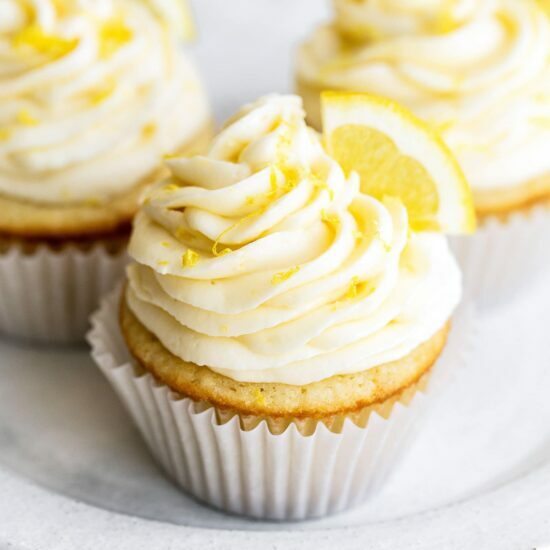 These Lemon Cupcakes are the recipe selection for the April Baking Challenge! Bake a batch, snap a photo, and submit your entry below for a chance to win one of three prizes (including a KitchenAid stand mixer) furnished by Bob’s Red Mill. Get the FULL details here. Preheat the oven to 350°F. Line two standard muffin tins with 15 paper liners. In a medium bowl combine the flour, lemon zest, baking powder, baking soda, and salt. In a large bowl, use an electric mixer on medium-high speed to beat the butter and sugar until fluffy and very well combined, about 3 minutes. On medium-low speed add the egg and beat until combined. Combine the milk and and lemon juice. Add in the flour mixture and milk mixture in alternating batches, starting and ending with the flour, mixing until just combined. Divide the batter among the prepared muffin tins, filling each 3/4 full. Bake for 15 to 20 minutes, or until a toothpick inserted in the center comes out clean. Allow the cupcakes to cool in the pan for 5 minutes before removing to a wire rack to cool completely. In the bowl of a stand mixer fitted with the paddle attachment, beat the cream cheese, butter, lemon zest, and salt on medium-high speed until very light, creamy, and smooth. On low speed gradually add in the sugar then the lemon juice and beat until creamy and smooth. If you need a stiffer consistency for decorative piping, add more powdered sugar. Hi, I would like to join the baking challenge, but I have an allergy to citrus. Can this recipe be made with pineapple or another fruit? Thanks! I am interested in joining the challenge, however I am allergic to lemons. Crazy, I know, but I am. Can another flavor be substituted? I can do any of the other citruses just not lemon. Makes no sense to me. How can i make this to a cake and which pan size? Can I double the frosting ingredients to have enough frostine for the cake? Also, can i add whipped cream to the frosting? Thanks! Please use decimal or scaled amounts throughout the recipe. Why is flour measured in cups but sugar in grams? No reason why baking soda or salt can’t be in gram either. Where is the print icon to print just the recipe? There’s two print icons at the top of the page and one in the recipe box under the title on the right side. Can we also have a video of the lovely lemon cakes for the challenge? It is such a help. No video this time, I’m afraid! Please ignore entries for Mohammed Williams. For some reason when I tried entering the first time even though I put my information in, the system pulled up my son’s email and Facebook instead. Thanks! I’ve removed the double entry so now it’s just yours! hi! is the amount of flour specific to bob’s red mill organic? still 2 1/2 cups if using king arthur’s all purpose? Can I substitute cake flour or regular cake flour for Bob’s organic flour? Have you ever made these as mini cupcakes using the mini muffin pans? If so, do you have any idea the difference in baking time? These cupcakes are amazing! Not too tart or sweet but so delicious! And that frosting, just perfect. Everyone raved about them! I’ll make these again for sure! Desperately need assistance: I’ve tried to make these twice now, but both times, my frosting separates or curdles, and I think it has something to do with the acid of the lemon juice and the dairy component of the cream cheese. Any thoughts about what is happening in my process? Many thanks!